In 2010, my Emma and I spent 10 months in a homeless shelter. That is a position that I never thought I would find myself in, but needless to say, it is one that I needed. Growing up though I don’t think any of us actually plan on losing our homes, but unfortunately, it happens more than most of us care to admit. The numbers are staggering. Just the sheer number of homeless children in this country should break your heart. On any given night in the US, there are an estimated 150,000 children spending their night homeless and that number? Could be way higher since it is so hard to track homeless children. Why am I telling you all of this? Because you, my friend, are blessed. If you have a warm home tonight, you’re blessed. If you have love and support from friends and family, you’re blessed. If you have a warm meal on your table (no matter what that meal may be), you’re blessed and those who are blessed should give back to those who may not be. Giving back isn’t always easy. In fact, sometimes it can be downright hard. When the bills are tight and the kids are screaming and you just want to give up and walk away, the last thing you want to think about is helping someone else. What you aren’t seeing though is that those moments are the exact times that you should think about giving back. It is those times that you need to feel the blessing that you have become to someone the most. Giving back, even when you think you can’t, is one of the most rewarding things you will ever do. How do you do that? It’s easier than you think. To touch someone’s life, all you need to do is show them that you care. Buy a coat for a cold child. It doesn’t need to be new, just warm. Trust me, they won’t care. Feed a homeless woman who is giving up her lunch at the soup kitchen to feed her child. I’ve been there and done that and trust me, I’d have eaten a horse if someone had given me one. One hot meal that I didn’t have to worry about Emma on would have made a huge difference in my life. Pay a small bill for a family in your church or neighborhood who may be facing disconnection. How do we give back? By helping those who are in the same situation that we once were. We built gift bags with personal care items for the homeless. Items like deodorant, toothpaste and razors might seem common place but to a woman who hasn’t had them for months? They are everything. Small acts can create big ripples when giving back like in this photo of my Emma. 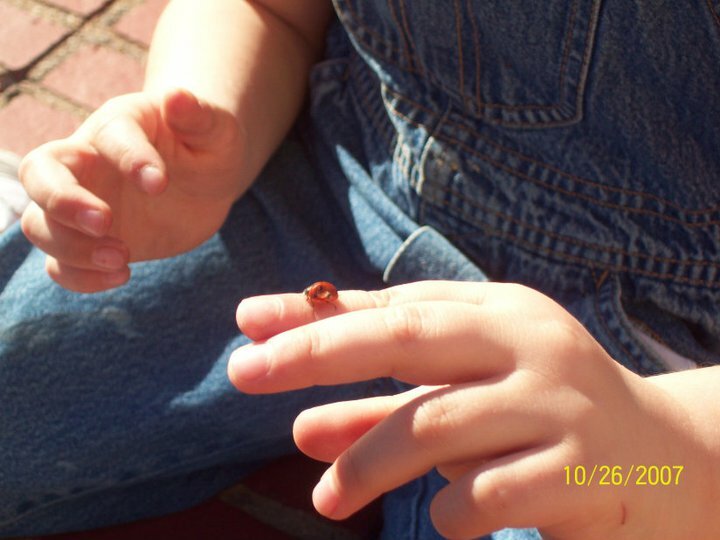 She had just lost a ladybug and was crying because she was sad when a little boy who we didn’t know brought her another to make her happy again. Western Union understands that giving back not only helps those who gives back, but those who are given to as well. The Western Union Chain of Betters project understand that when money moves, better things happen. As money sent through Western Union travels around the world, a chain of help and giving back is created. To the business owner who may be ready to lose his building and the Mom who just needs to buy groceries. The Chain of Betters project empowers people in a way like never before. It challenges them to empower, bless and give back to others who may simply need just a hand up. Even something as simple as a home baked cookie decorated by a child with love can go a long way. 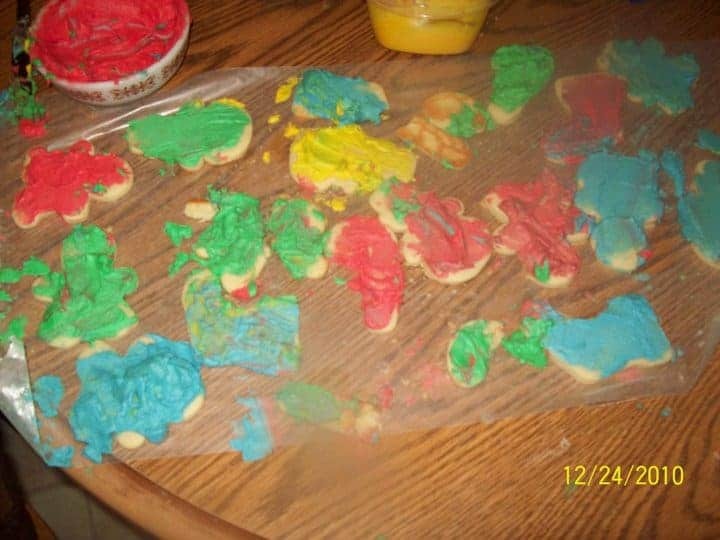 While her decorating skills have improved as she’s gotten older, these cookies in the photo were the very first that we added to our gift bags for the homeless. Know what? Every single person that we gave a bag to ate them and told her what an amazing job she did. She had brought a smile to their face and that was all that mattered to them. The Chain of Betters project was born of a desire to help people. As the chain of good moves around the world, it creates an opportunity to help people in ways we never imagined. To better the lives of those who need it and yes, to give back. That year for us was a hard one for me and even harder on my little. She never let on, but a Mom knows. 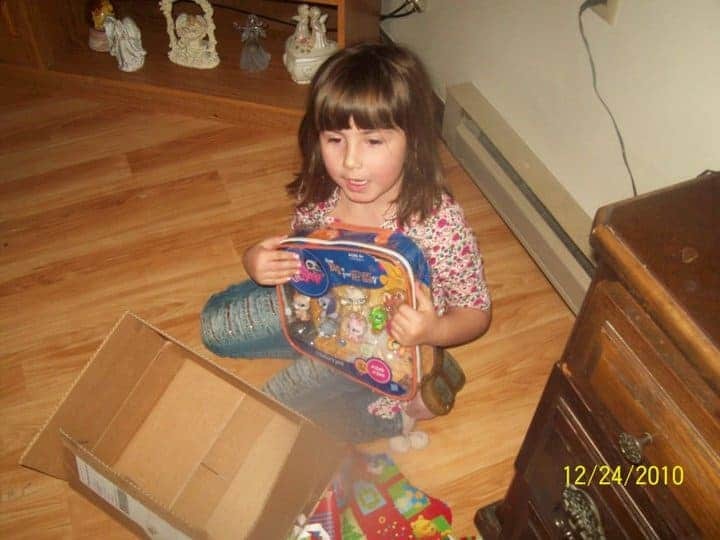 Those Littlest Pet Shop pets might have been just a few bucks to someone, but to whoever donated them? They meant the world to her and they meant even more to me. She smiled that Christmas because someone gave back. 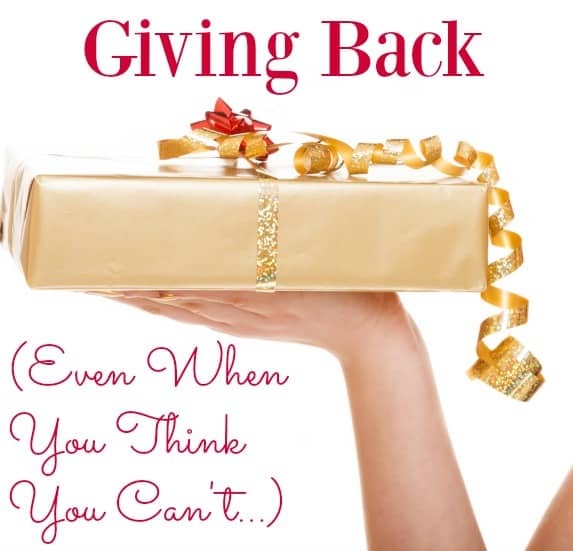 So I challenge you…how will you give back today? Will it be something big like a donation? Will it be participating in the Chain of Betters? Will it just be a smile? No matter what you may think? You are always…and I do mean always, able to give back.